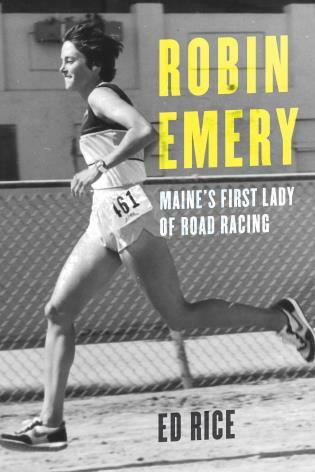 Robin Emery of Ellsworth, Maine is a pioneer in the sport of road racing, or distance running. She fell in love with the sport of running in 1967 and, fifty years later, she is still at it. When she started, women weren’t allowed to race with men and there were no sports teams for girls in schools, but that was no deterrent. Robin persisted, trying a range of sports as a child from golf to football before establishing herself in the field of running. Along the way she has encouraged and inspired countless girls and women—including Maine’s Olympic gold medal winning Joan Benoit Samuelson. Ed Rice grew up in Bangor and has been an arts critic for the Portland Press Herald/Maine Sunday Telegram, Maine Times, and Maine Public Broadcasting System’s “Maine Things Considered”. He has taught journalism and communication studies at several colleges, as well as taught high school English and coached cross country. He lives with his wife, Susan, in New Brunswick, Canada.